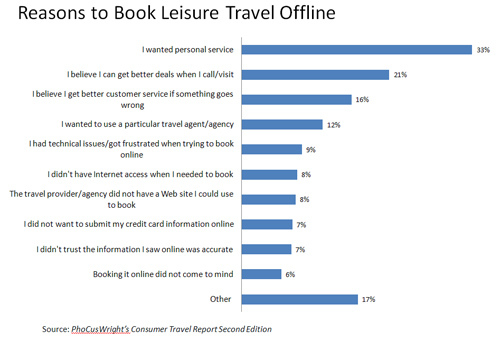 Interesting release from PhocusWright, giving some insights into the minds of leisure travellers who prefer to book offline. The biggest reasons for customers booking offline are personal service (33%), the feeling that they would get a better price booking offline (21%), and a belief that they would get better customer service if something goes wrong (16%). Despite the US focus of this survey, all these factors will be familiar to ecommerce and revenue teams in Asia. Pricing concerns can be overcome to some extent by price guarantees, although in the real world of small chains and independent properties, it is difficult to retain enough control over retail pricing to ensure that the website has the lowest rate. Some of the historical reasons for booking offline, such as a reluctance to provide credit card information, are less important now, with 7% of respondents saying this stops them from booking online. An important consideration for those of us in Asia Pacific is that PhocusWright surveyed US travellers, whereas in Asia Pacific, online purchases are far less common — indeed Ctrip.com in China built up its huge lead as the OTA for China by pioneering offline payments for online bookings, and currently only a third of bookings are done through the website. The good news for the tech guys is that only 9% of customers said that technical reasons prevent them from booking — a definite improvement on the past, now that usability testing for websites is becoming more commonplace. While technology can help, a more holistic focus is needed to ensure that service to customers making online bookings is easily accessible, giving customers confidence to book online. Too often the website is run by the marketing or revenue departments, with not enough coordination across the various parts of the business that customers are likely to come into contact with: for example, how well does your call centre know your website?